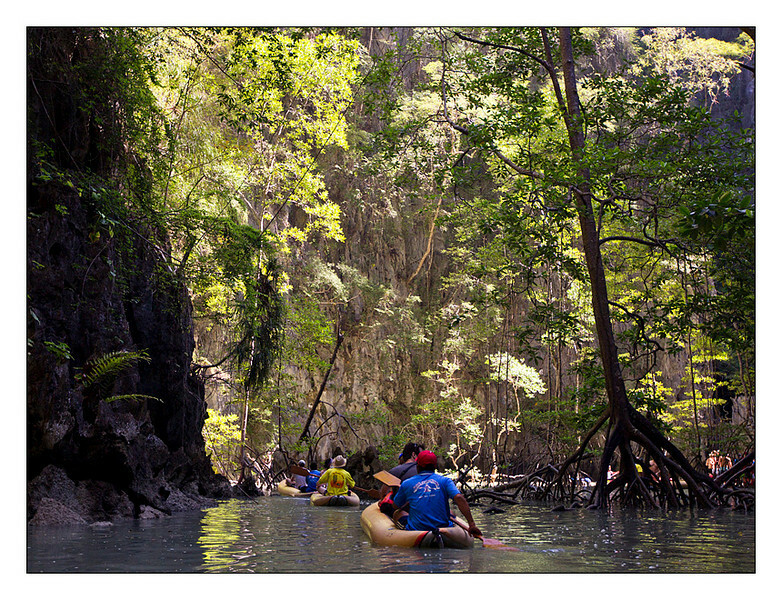 Today's activity was confined to a cruise and kayak exploration of Phang Nga Bay. 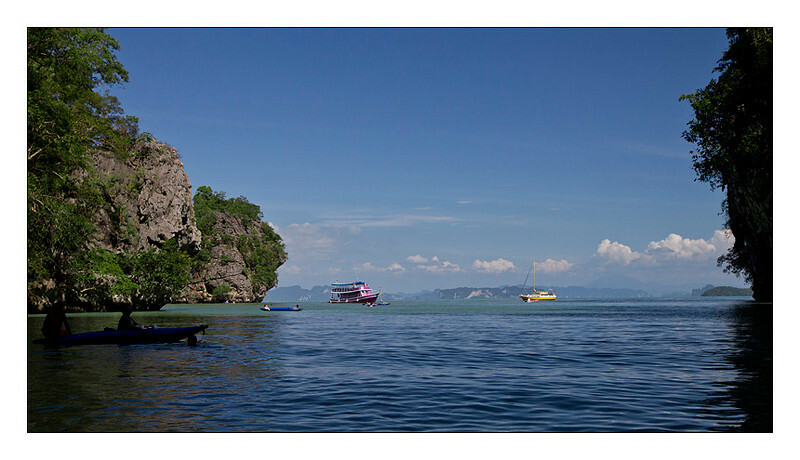 The bay is filled with over a hundred little islands, almost all uninhabitable. 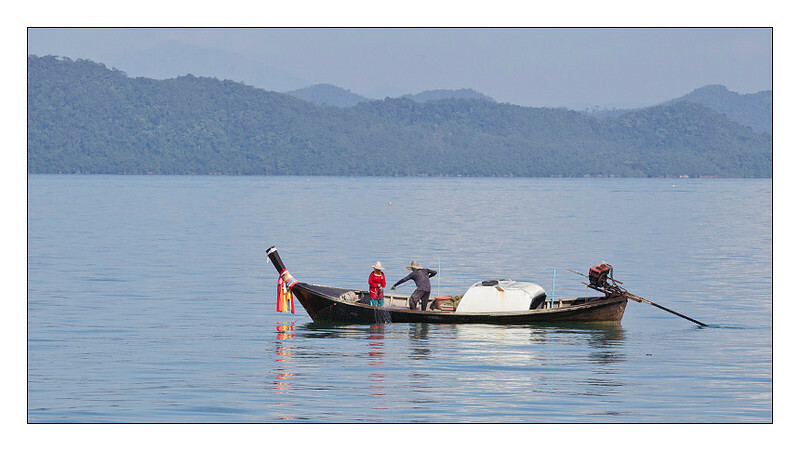 We were picked up from our hotel and were immediately concerned that we would have an hour plus long ride but instead it was about a thirty minute ride to the eastern side of Phuket Island to the dock where we met our boat. 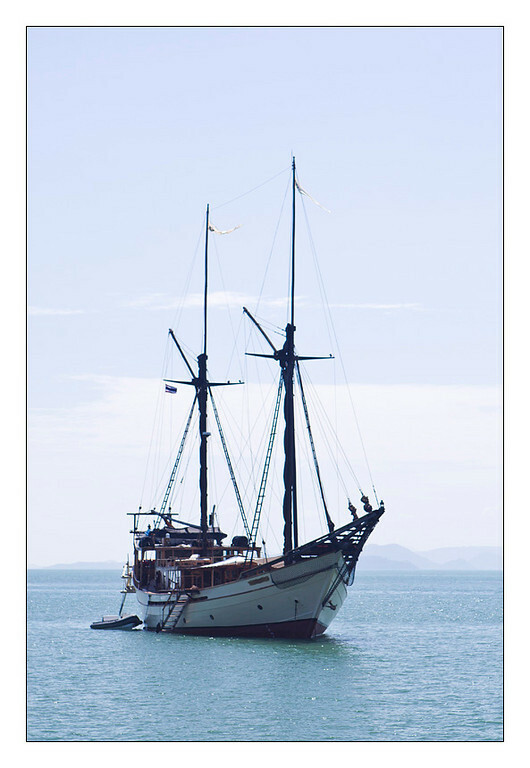 As seems to be common in Thailand, we were quickly greeted and then boarded to boat so that we could get moving. I suspect that because there was recently a full moon that the tides are something that we are working around and therefore the need to rush. 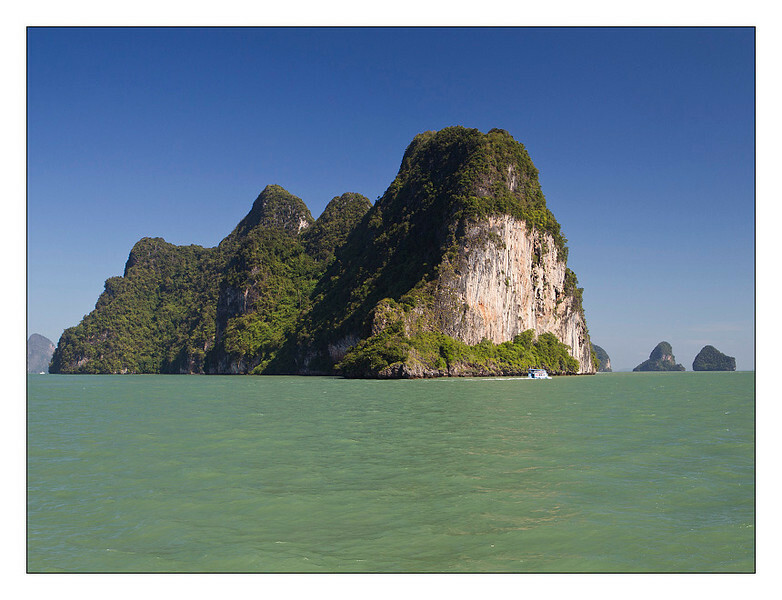 It was only a short time later, as we were travelling north towards Phang Nga Bay that the islands came into view. 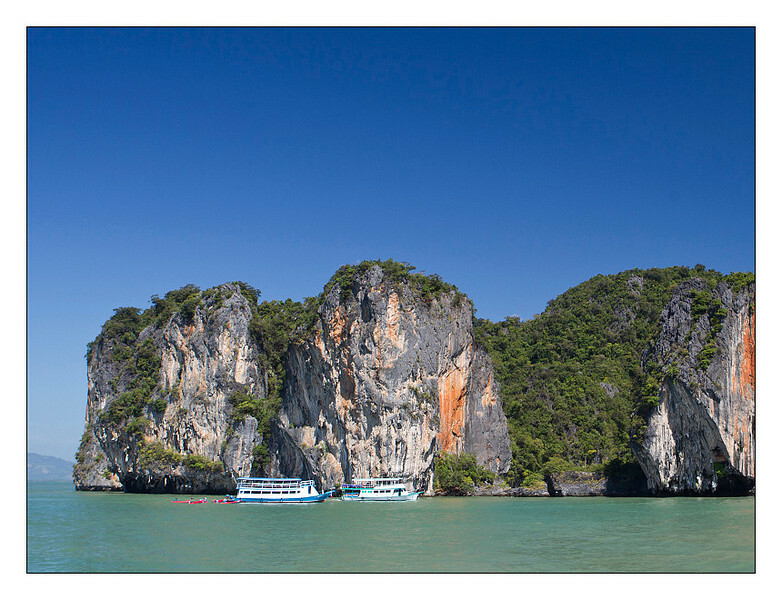 Panoramic view of the islands in Phang Nga Bay. 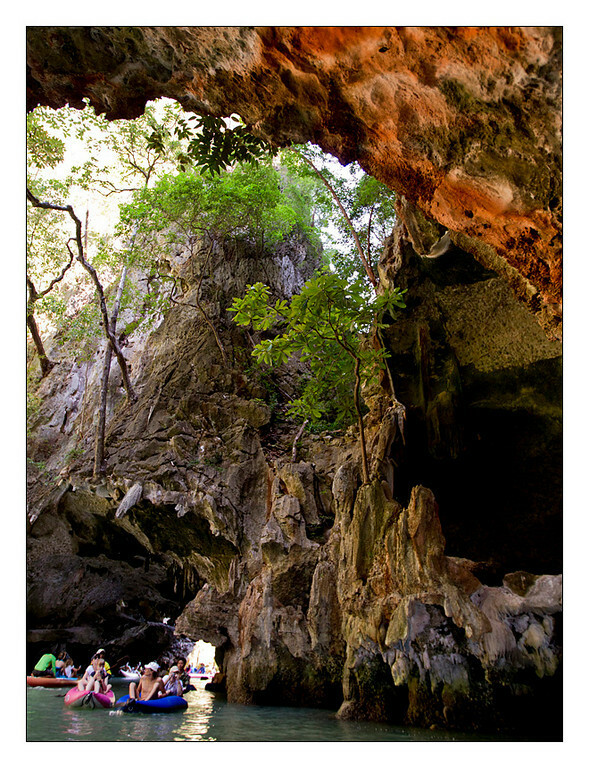 Our first stop included kayaking into a lagoon, or hong in Thai, accessible only by a cave at low tide. 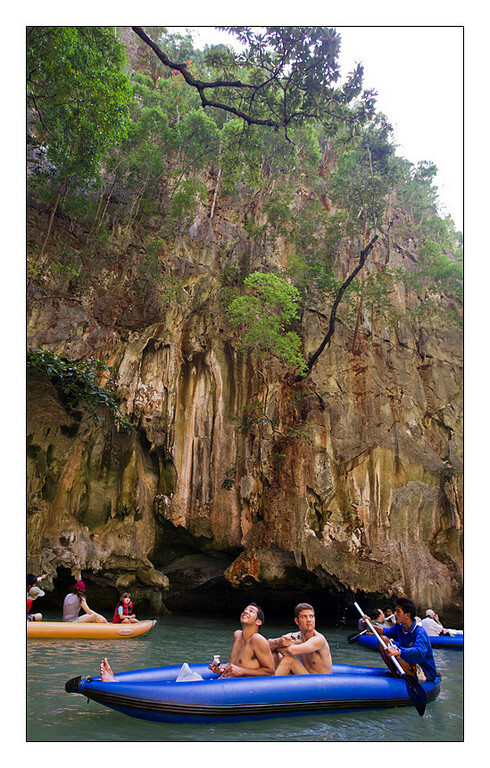 There are points where the top of the cave is so low that you need to lay down in the kayak to pass through and as you emerged you are surrounded by steep limestone walls with stunted trees and shrubs rooted into the rock and tall thin mangrove trees reaching out of the middle of the lagoon. 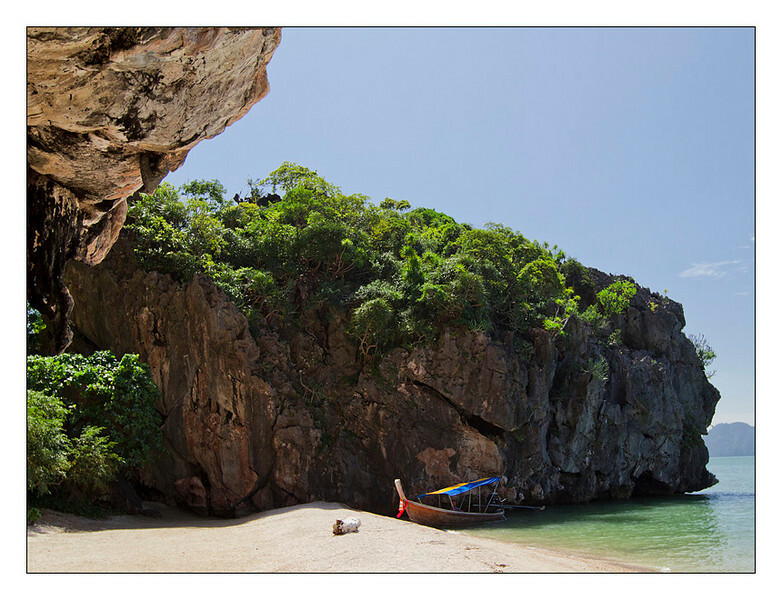 Our second stop was a Hong Island. 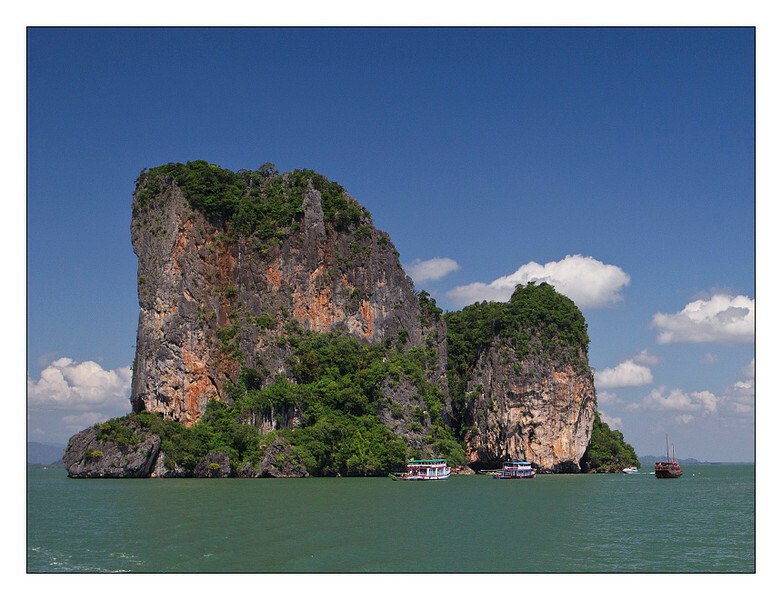 As the name suggests this island is most remarkable for its easily accessed lagoon. 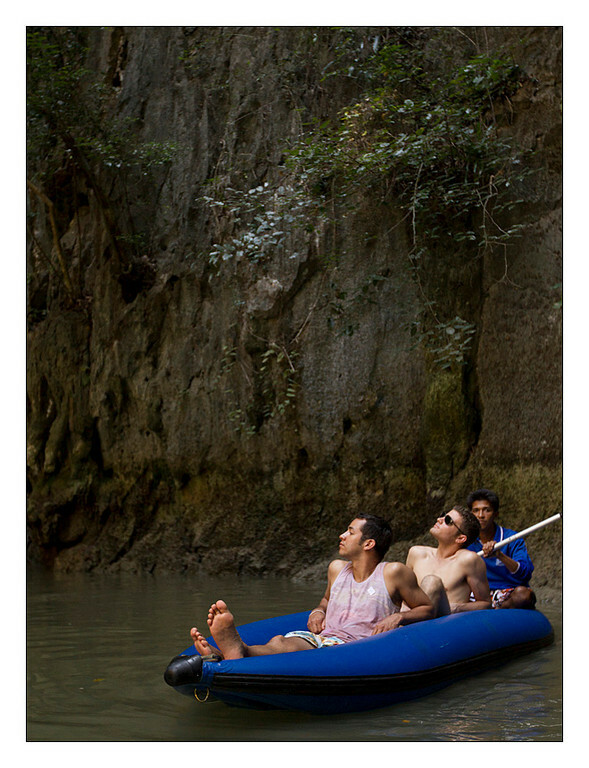 There are no caves here which require you to lay down in your kayak to gain entry. 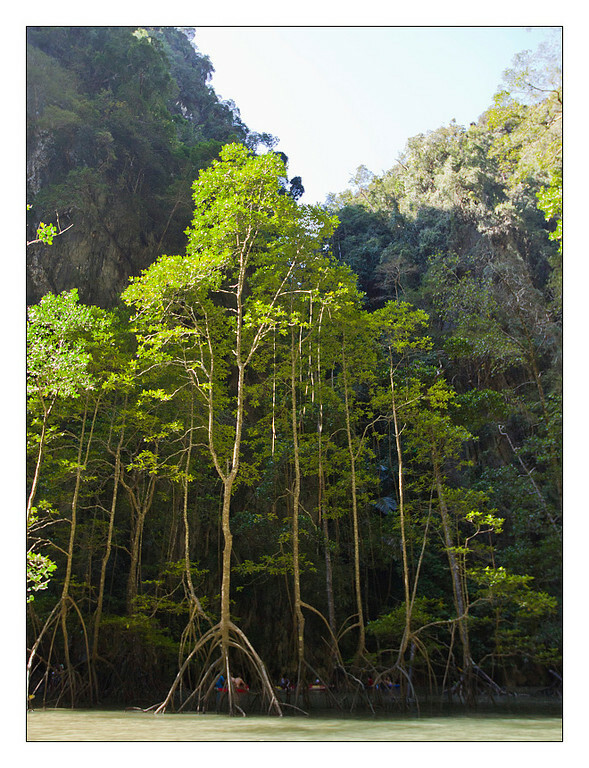 Emerging upright from a cave into the lagoon. 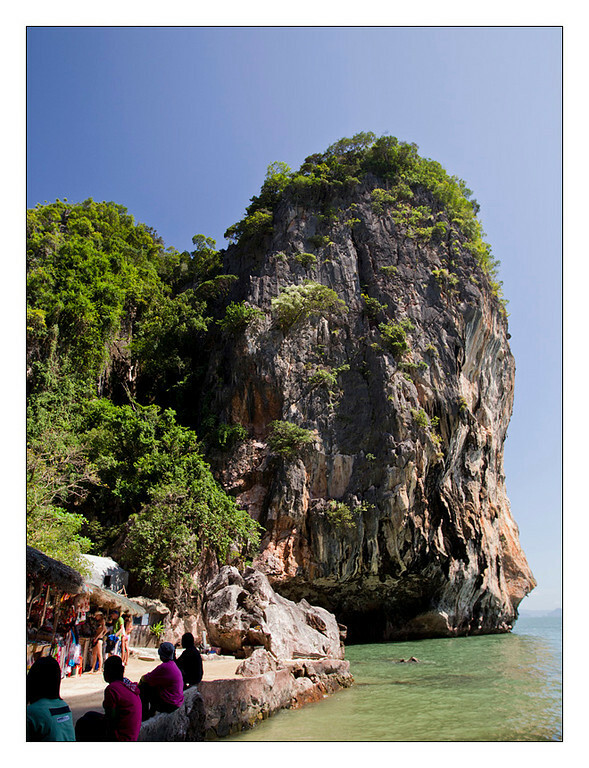 Our second stop was at the island now known as James Bond Island. 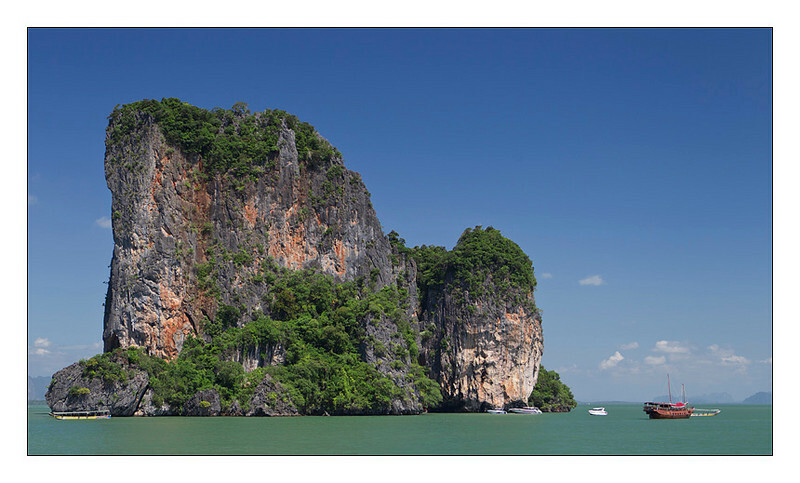 It was the location used in "The Man with the Golden Gun" as Christopher Lee's island base. There are really only two beaches on this island but somehow it seemed bigger in the movie, although maybe my recollection is not quite right, it has been years since I've seen it. Because of its cinematic connections this is a heavily touristed island. So much so that there are semipermanent stalls to sell junk to tourists that have been erected on part of the island effectively ruining the beauty of the larger of the two small beaches. 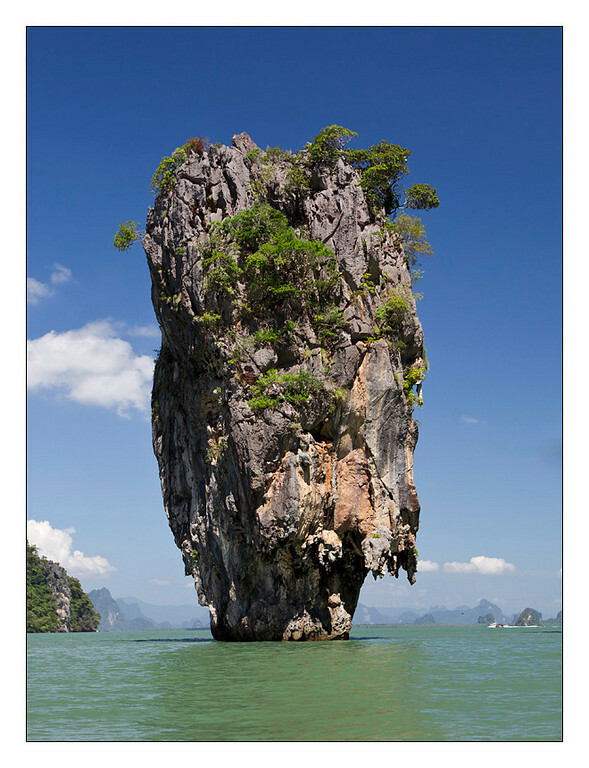 The third island visited, James Bond island. A longtail boat beached on the shore. The shops set up on the beach. 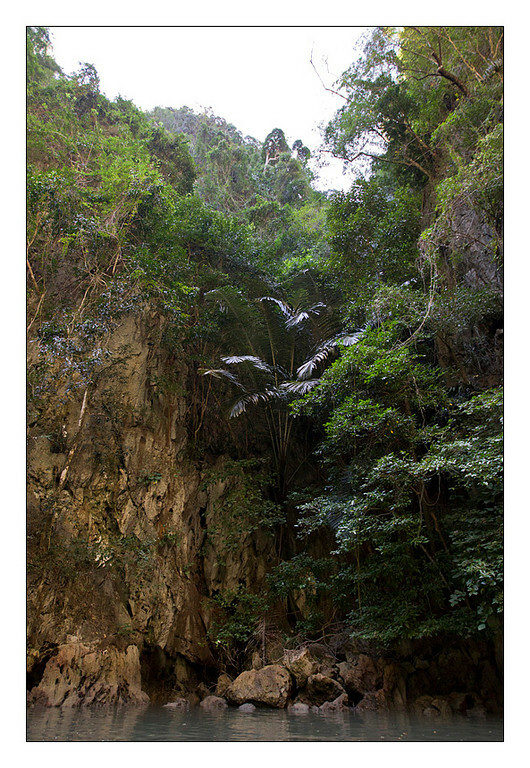 Our final stop was off of a small sheltered area of one of the islands where we were given the opportunity to explore by kayak or swim at our leisure. It was nice to get out of the sun and into the water because even though the air movement on the boat is nice when you stop it can be a bit hot with the sun beating down on you coupled with temperatures in the upper eighties and the high humidity. After about an hour we returned to our boat to make our way back to the dock. The sun was starting to get low in the sky and as we returned we passed fishermen in their longtail boats with lines or nets in the water hoping for white snapper or grouper or any one of the good sized fish that inhabit the bay. 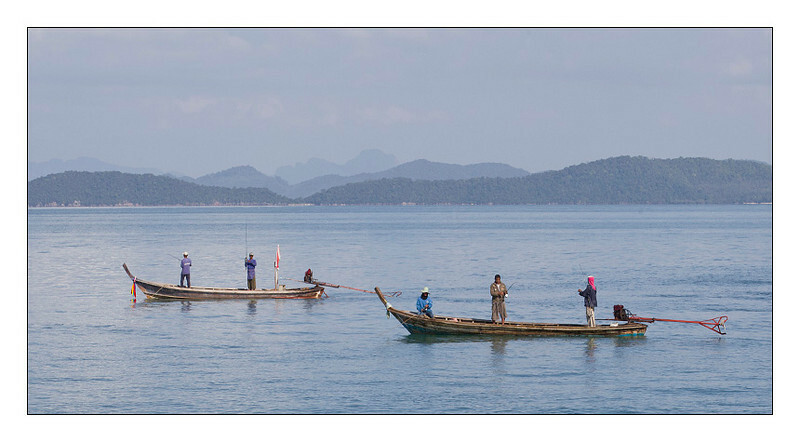 Fishing by net in the bay from a longtail boat. When we arrived at the dock we were met by the van that brought us almost eight hours earlier and from there were returned to our hotel for dinner and an early night in. It was nice to get out on the water today and fortunately we weren't obliged to be in the sun constantly. Tomorrow we return to the bay for an afternoon and evening tour of the islands when there are less people. Merry Christmas eve! 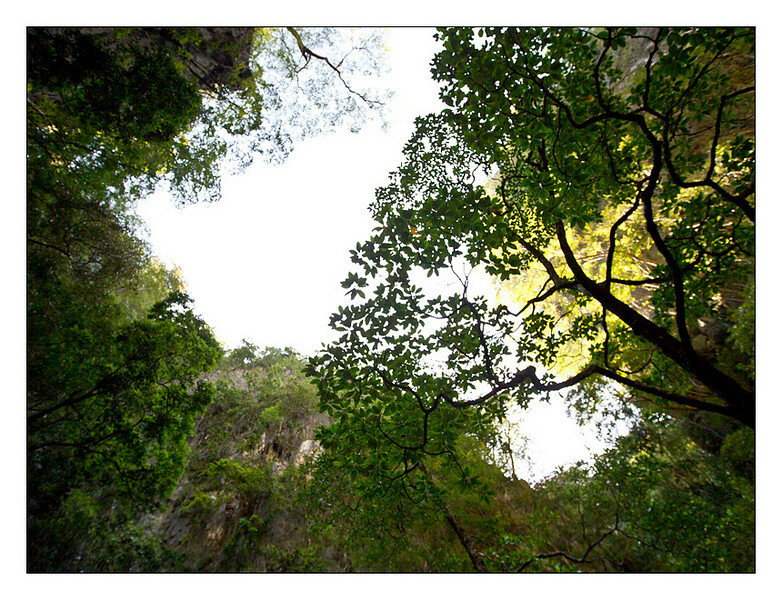 Amazing photos... a part of Thailand I have never seen. 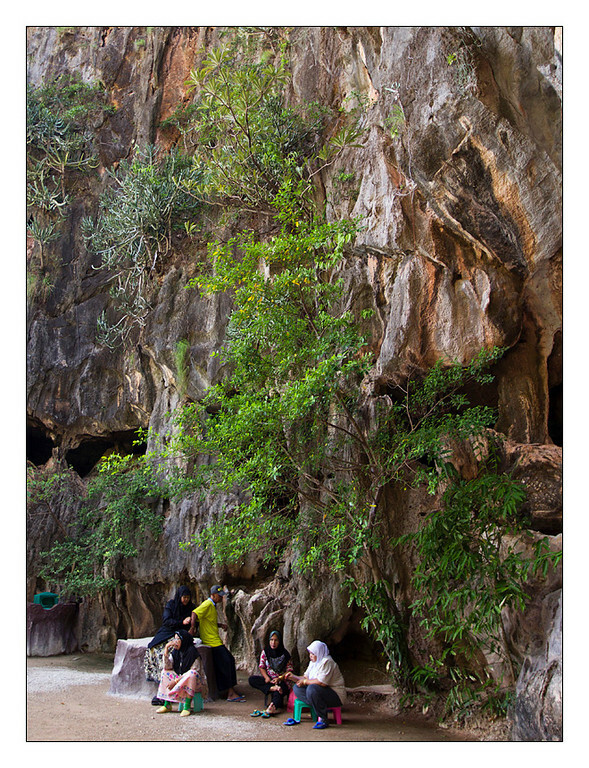 You have taken the most amazing pictures...I love the Mangrove trees...and these "rock sculptures" ....amazing!